Renowned interior designer Thom Filicia, a 1993 graduate of Syracuse University’s College of Visual and Performing Arts (VPA), will sign copies of his new book, “American Beauty: Renovating and Decorating a Beloved Retreat”(Clarkson Potter), on Friday, Nov. 9, from 4-5:30 p.m. on the fourth floor of The Warehouse, 350 W. Fayette St. Admission to the book signing is $44, which includes a copy of the book and a cocktail reception with Filicia. Filicia wasn’t looking for an escape from his busy city life, but when visiting beautiful Skaneateles Lake, N.Y., a place he discovered growing up, he fell madly in love with a fixer-upper. Part memoir, part decorating book, “American Beauty” is the story of this house and an inspirational resource that imparts Filicia’s extensive wisdom on creating rooms that feel meaningful and classic, yet modern. The book signing and reception are presented as part of Orange Central 2012, which takes place Nov. 8-11 on the SU campus and includes reunions, special events and Homecoming, all rolled into one exciting weekend. Filicia will be honored with the George Arents Award, SU’s highest alumni honor, during Orange Central. To register for the book signing and reception, contact Traci Washburn, VPA director of alumni affairs, at 315-443-4728 or vpaalum@syr.edu. SU alumni attending Orange Central may register via the Orange Central web site. From his start at renowned design firms, including Parish-Hadley, Filicia launched his acclaimed enterprise, Thom Filicia Inc., and has emerged as one of today’s most influential and respected interior designers. His clients have ranged from Tina Fey, Delta Air Lines, Jennifer Lopez and Peter Jennings to those in the worlds of finance, sports and hospitality. Gaining fame on the Emmy-winning “Queer Eye for the Straight Guy,” Style Network and HGTV, Filicia is a bestselling author and has been praised as a “Top 100 Designer” by House Beautiful and an “A-List” designer by Elle Décor. Additionally, he has been featured in the New York Times, People, In Style, Vogue Home, O, USA Today and many other national and international publications. He has appeared on “The Oprah Winfrey Show,” “Good Morning America,” “The Tonight Show with Jay Leno,” “The View,” “The Today Show,” “Ellen,” “Late Night with Conan O’Brien” and many more. He is also the driving force behind the Thom Filicia Home Collection. 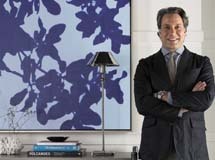 For more information, visit www.ThomFilicia.com.